... also required large rolled up newspaper to beat back his Mum who was constantly trying to wipe his nose... incidently now she is nagging me to send her the picture on CD 'cos she likes it so much. Thanks to all those who commented, especially to folks who found the picture to their tastes or at least not-too distastefull to see its merits. It's a great shot your family will enjoy for generations. I don't like pictures of such things, but I had to give you a 7 for that title. I knew this was likely a sub-fiver, but again, I applaud you for daring to enter something different. No cliche shots here! haha brilliant capture!! Love it! I think this is one of the best shots in the free study. Looks like he just finished a bout of crying, and suddenly started to smile. My nephew does this... he will cry, and completely turn it around and smile a moment later. Some voters might be turned off by the boogies from his nose, but I think it makes this shot. A little gross, but very real life. I expect this to get creamed in voting, but I have to give you some kudos for a very truthful observation that I have never seen anyone capture before. A lovely little vignette that feels very real and natural. 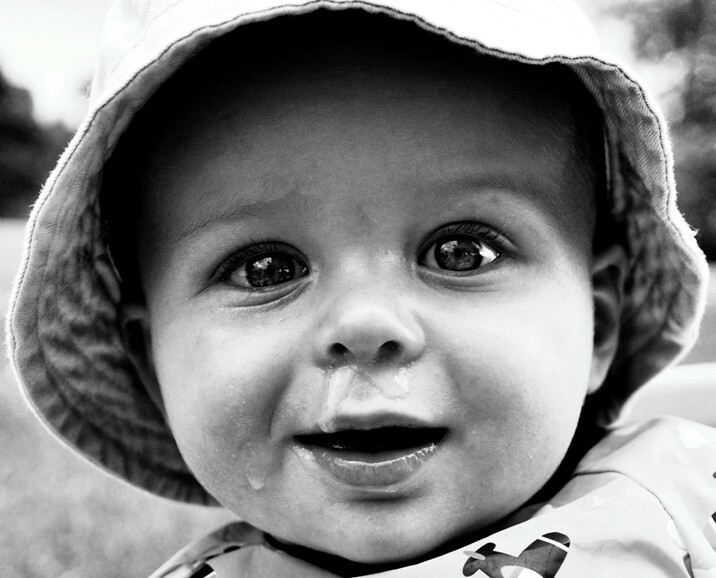 You don't often get that type of impression of a baby in black and white. Very nice conversion, although the texture of the cheeks are a little washed out. The very slight grain effect is a plus. Well done. Fill the frame indeed. Looks great in black and white. Proudly hosted by Sargasso Networks. Current Server Time: 04/24/2019 03:50:24 AM EDT.